No other expedition in the world is dedicated to spending as much time amidst ice floes and glaciers in one of the last wild and frozen frontiers on earth - Svalbard. We will take you to this spectacular and photogenic destination where the polar bear is king. We plan our expeditions in April and May in Svalbard when the ice is beginning to break up. Our expeditions are an ice lover’s dream. Besides seeing the Isbjørn (Norwegian for ice bear), we will also encounter walruses on drifting ice floes and on shore. The walrus population has been on the increase over the past 20 years, and we will linger as long as possible to get close to these massive mammals to observe and photograph in detail. During our landings, we will search for the stocky Svalbard reindeer and the beautiful Arctic foxes. We hope to encounter various seals species as well as whales. Svalbard is also home to some of the largest concentrations of Arctic seabirds. We will see large colonies of little auks, Brünnich's guillemots nesting, black-legged kittiwakes, ivory gulls and fulmars. With luck, we may even see puffins flying along the cliffs. Our Wild Focus Expedition starts with spending two nights and a full day in Longyearbyen. We have an action packed day planned to get us ready for our expedition on the ship. After our first breakfast, our group will split into two. This year we are offering two adventurous and exciting options to our group. We can choose to spend our first day on snow mobile and travel across a treeless tundra to a fjord on the east side of Spitsbergen. If our drivers are experienced enough, we may be able to venture across to the East Coast. During this adventure, we will have great chances of seeing Svalbard reindeer, seals, ptarmigan and maybe even a polar bear. The reindeer that we will see are very curious animals. If we are still and quiet they may approach us within a few feet. In addition to snowmobiling, this year we will take up to 8 people dog sledding for the full day. We will have 2 people on each sled who will take turns at driving the sled (mushing). We will learn how to harness our dog team, control the sled, give commands and mush for the entire day. While one person is mushing, the other person is relaxing on the sled under a blanket experiencing the glistening snowy Arctic landscape while looking for wildlife. We will mush out to a glacier where we will secure our dog teams and sleds in the ice. We will then take our helmet and headlamp from our sled in order to descend deep into an ice cave inside of a glacier. We will have ample time to explore the ice cave to enjoy its beautiful ice formations in total darkness with our headlamps. The dog sled mushers will switch out after lunch to give everyone experience with dog mushing. On both trips, we will have lunch outside enjoying the gorgeous scenery and landscapes of Svalbard. Since we can only take 8 guests mushing, there is a first come, first serve policy for sign-ups. Please note that anyone opting to go dogsledding must be in good physical condition. After our adventurous day out on the tundra, we will return to our cosy Basecamp and enjoy a wonderful dinner together as a group to share the details of our day and to start off our expedition. 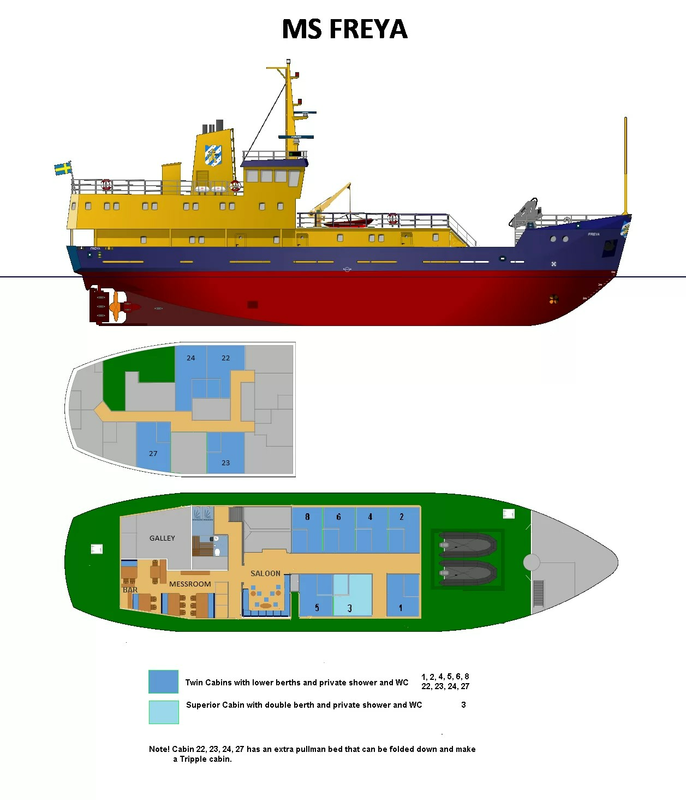 The next day we will board the M/S Freya which will be our home during the expedition. It will take us along the western side of the island of Spitsbergen and possibly to the eastern side depending on the ice. Because drift and fjord ice conditions vary from year to year, we will travel to either the southern or northern fjords to search for polar bears, our main goal. 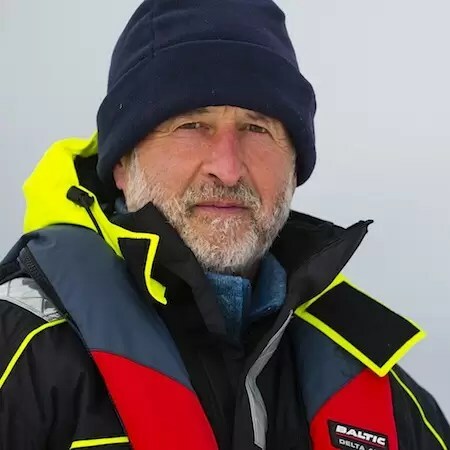 Our captain and crew are highly experienced and have traveled these arctic waters for many years. Because we specialize in exclusive small group travel (14 passengers maximum), we have freedom and extra flexibility on our Svalbard expedition that may not be enjoyed with larger groups. We can linger as long as we like at wildlife sightings. We have time to capture the perfect light while enjoying or photographing the majestic landscapes. We will look for calving glaciers and stunning icy landscapes during our expedition. Because pack ice is dynamic and always changing, each day will bring a new adventure allowing us to have a glimpse into the life of the earlier adventurous Arctic explorers. We hope to welcome you to the Arctic's sparkling icy realm - one of the most remote, fragile and magical locations on Earth. Svalbard is Wild Focus Expeditions’ flagship tour and usually fills far in advance. Please don’t miss this once-in-a-lifetime-experience; Svalbard should be on every adventurer’s and nature lover’s bucket list. After our last breakfast on shore and some relaxing time to wander around the town of Longyearbyen, we board the M/S Freya and depart the Adventfjorden at approximately 16:00. Breakfast, dinner and overnight stay on the M/S Freya is included, while for lunch we are on our own. Our ocean expedition begins now! The next nine days are dedicated to exploring the Svalbard Archipelago in search of the ice bear and other northern wildlife. We will photograph towering glaciers and sea ice in many shapes and forms. Because we chartered the entire ship, we are free to go where the light and ice take us and linger as long as we like to capture the magical light available to us for arctic photography. Breakfast, lunch, dinner and overnight stay are included on board the M/S Freya. We enjoy breakfast on the ship before disembarking in Longyearbyen in the morning. We transfer to the airport in Longyearbyen to connect to our outbound flights home. Please book your flight out of Longyearbyen no earlier than noon. For this ship-based trip, a relatively moderate level of exertion is required. You will need to be able to climb into and out of rigid inflatable Zodiac rafts for excursions ashore and have the ability to walk one to three miles over sometimes rough and uneven terrain such as rocky beaches and/or snow. This is an active expedition that requires mobility and good health. Travel via Zodiac may include variable conditions and can be quite bumpy and windy. If it’s windy, you may get wet from sea spray. Travelers must be prepared for any type of weather, including extreme conditions that may involve high winds, rain and snow. While seas are generally calm on this expedition, it’s possible that we could encounter rough conditions which may cause issues for travelers prone to motion sickness. Please consult your physician about medications that control motion sickness. Inquire specifically about the Transderm Scop patch which we have found to be extremely effective without causing drowsiness. Discuss this with your doctor first because it should not be prescribed if you have been treated for glaucoma. On some Svalbard Expeditions, we offer the chance to spend a full day traveling on snow mobile or mushing a team of sled dogs. Dog sledding is very active and good physical health is a requirement. You will be responsible to control your team of dogs after receiving basic training on dog mushing. Travelers with severe back problems should avoid this activity as mushing can be bumpy and require upper body strength to control the sled. Please discuss this activity with your Expedition Leader is you have any doubts or questions. "There is a magic about the Arctic that is difficult to describe...even for me having lived in the far North for more than two decades. You have to experience it for yourself. Svalbard is one of the best places to do so!" “The Arctic is indescribably beautiful. For centuries, explorers were drawn to it. It is one of my very favorite places to photograph and explore. Ice is a photographer’s dream. And polar bears, the ultimate predators, live in this icy landscape. This expedition is the ultimate adventurer's adventure and will give you a fantastic opportunity to see the mighty polar bear in his natural and magical habitat."